These two are henchmen bodyguards for my Spiritseer – they are basically Striking Scorpion proxies, and are intended to represent the spirits of long-dead warriors that are occupying small Wraithwood construct bodies in order to serve in un-life. 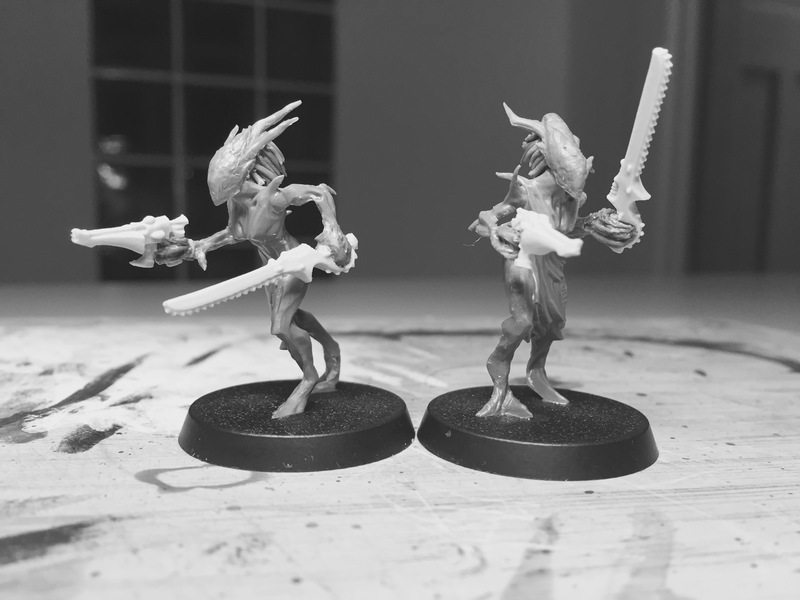 Hmmm… I’m not really sure how I feel about these two… I’m going to play with the posing a bit, shorten the necks, and refine the head shape to look more like mini-wraithlords and less like daemons or xenomorphs! 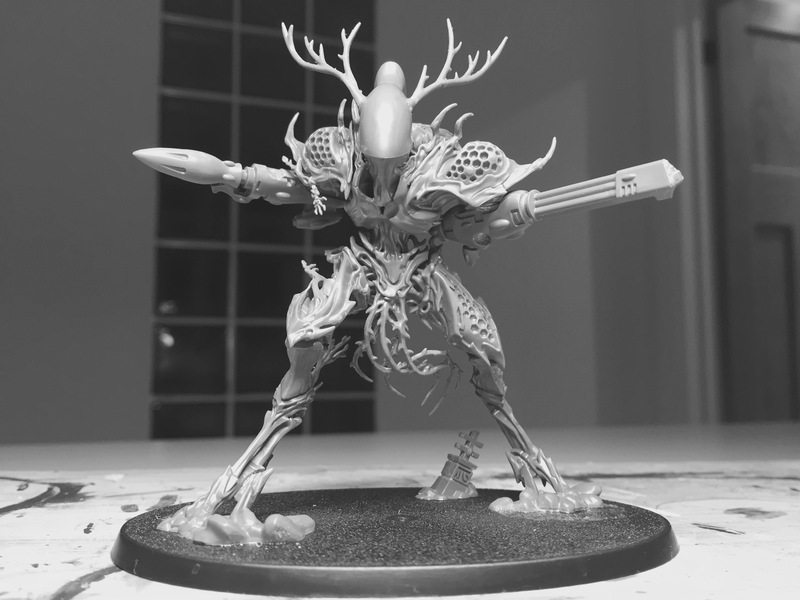 They may get mandibles, I’m also going to give them loincloths & nodules to bring them back into Eldar territory… I’m not sure if I like them or not at the moment – I think they are ok, but I’m aiming for excellence with this project, and ok isn’t going to cut it… I will reserve judgement until they are finished, but I’d love to hear your thoughts in the meantime. I think I’m on firmer ground with this fella – he will fill my Walker slot, (fnarr), and he is coming along very nicely in my opinion. He’s basically a Warwalker proxy, but piloted by the dead rather than the living. I’m much happier with this build, and I particularly love the pose on this guy – he reminds me of an old ‘eavy metal pic of an Adeptus Titanicus Phantom, which makes me very happy :-) Again, there is a bit to do – I’m planning a loincloth & nodules again, and the gun-arms will have vines holding them on to the chassis. I love the Walker mate. You’re right with the pose. Where did you get the antlers from? All coming along very nicely mate. I can’t wait to see more trees!!! The walker looks great. I’ve always wanted to make one out of that model and you’ve really made a good start with it. It suits your warband down to the ground ;) The other two do need something, maybe roots coming out of their legs or something like that as it will give them balance. IRO sent the buildings so hopefully we can arrange a meeting to create the Albino Woods. I can’t wait to see more trees! Great work! Am I the only one getting an alien from Alien feeling? Very cool, mate! The walker construct is great. I would try drop the guns down a bit, they look a bit jammed onto the hives. You could do that with the vines you were talking about. Over to the striking scorpions, first, my first thought was just that – Look Scorpions! The one to the left got a pose that works, it moves with a purpose. But the one to the right is a bit too static. The arms don’t work like that. But overall, great stuff. Great stuff. The wooden scorpions really need the mani-blasters, or similar. Maybe go wtih hives like the shoulders of the walker? They need to crouch more too. Looking good once more! Only comment on the walker is that it needs something to blur the lines between the organic and the inorganic but your vines on the guns should cover that. Nice work on these guys. I know the pic you’re referring to, and the Walker definitely echoes it. I like the heads on the Dryads as well. They have the “eldar” shape to them while the roughness works to keep them in with the “wooden” nature. I wonder if it might also be worth adding in a very subtle texture to the walker’s head as well? The scorpions probably need something else? They’re a bit thin, while the Striking Scorpion models have a little more bulk to them. Literal “Scorpion” tails made of branches? Or just bulked-up chest/shoulders? Wooo, these turned out exceptionally well, I love the vibe they all instil. Good job, mate!